Cox's Bazar, Bangladesh - Eighteen-year-old Rohingya refugee Amir Mia is carrying his deceased grandfather's body through the Balukhali expansion camp in the Bangladeshi port city of Cox's Bazar. He is taking his grandfather to be buried in a graveyard that was created after the recent influx of Rohingya refugees, fleeing violence by the Myanmar army that the UN has described as ethnic cleansing, began on August 25. He was elderly and died of age-related diseases, he explains as he winds his way through the camp's narrow, muddy lanes. As various waves of Rohingya refugees have fled Myanmar over the past few decades, filling the camps, which have in turn expanded, camp residents have buried their dead wherever they could find the space. 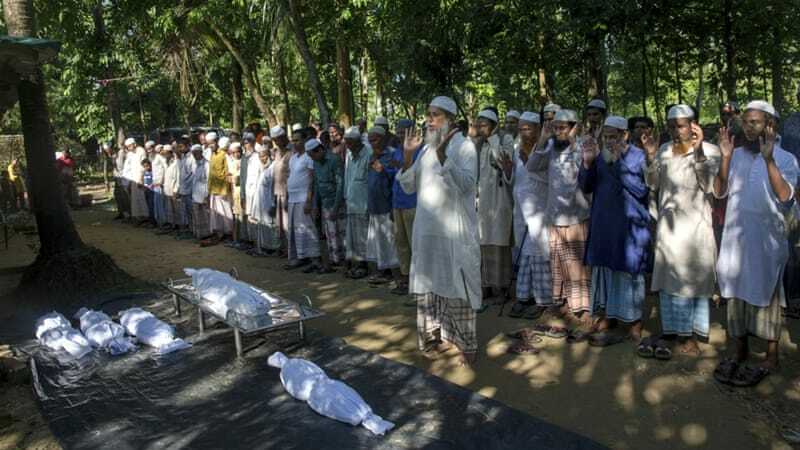 Without any land being set aside for graveyards by the Bangladeshi government, the refugees have identified their own sites. The small graveyard in which Amir is burying his grandfather already looks overcrowded. The graves are packed closely together, temporary bamboo fences separating one from another. In the neighbouring Kutupalong registered camp, 16-year-old Mohammad Alam, who was born in Bangladesh after his parents fled Myanmar in the 1990s, explains that his father is the leader of one block of the camp and a gravedigger who is responsible for digging graves for the residents of his block. The graveyards have become overcrowded, Mohammad explains, with three or four bodies being placed in each grave after the recent influx of refugees. "Unlike life, death is an inevitable truth and here no one can be buried peacefully as we must dig old graves to make new ones," Mohammad elaborates as he stands at a tea stall beside one of the new graveyards in the Kutupalong expansion camp. He has seen people burying their dead in front of their houses, he adds. "New refugees don't know about this place. They don't know where to go or what to do. I have seen a family burying a dead body just beside their newly built house. "A few days later, the rain had washed the sign of the grave away and more new refugees came and built their tent over that grave." Fifty-two-year-old Nur Hossain has been living in the Kutupalong registered camp for the past 26 years. He was a farmer back in Myanmar, but in Bangladesh he works in a soup factory in the camp and as a gravedigger. He came here in the early 1990s, with his wife and three sons. "The Myanmar army killed my brother Komol Hossain in early '90s. They took him to be a slave and two months later, we were informed that he had died. We ... don't know how he died," says Nur. "They [the Myanmar army] said we don't belong in Myanmar. "We live like prisoners here - free but not allowed to work outside [the camps]. Even after death, we do not have a specific place [to be buried]," he says. "I dug up one grave more than four times for burial. One of our oldest graveyards is now somebody's garden." Nur says death scares him more than anything. "When I dig graves, I always say Allah's name, as [I know] I have to die some day. This fear of death haunts me all the time." Nazu Mia came to Bangladesh when he was an adolescent. He's now in his early 40s, and says he's accepted his fate. "My life spent in a jail [refugee camp]. I will be here until my death and I don't know whose grave I will share in my next life after death," says the gravedigger who lives in the Kutupalong registered camp. "We buried dead bodies in the old graveyard which was allocated for the refugees of the '80s. In all graves, more than three dead bodies were buried. Now the situation is worse: people are living over new graves," he explains. "We have been asked if we need food, shelter and health assistance but no one asked if we need a bigger place for a graveyard or if we need to expand an old one. Even the place that has been allocated for new refugees is very small. In future, we might bury more than 10 dead bodies in a single grave." "We need more space for graveyards otherwise people will start digging graves in their own houses. It will take a decade to transform houses into tiny personal family graveyards," Nazu says. "Won't we get a place to rest in peace?"